Newly developed Multi patches take full advantage of new S.A.G.E.™ (Spectrasonics Advanced Groove Engine) technology with multitrack grooves which show the full potential of Retro Funk with Stylus RMX. This is a very live and loose sounding track from Guitarist Larry Mitchell. One of the coolest things about this track is that the Trilian Bass parts were played by Larry on his MIDI Guitar, which really makes a big difference in the realism of those bass parts. 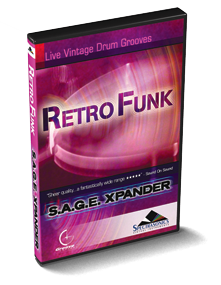 All of the drums are coming from the Retro Funk SAGE Xpander. Good example of how Retro Funk is very useful for Rock stylus too. Mike has some good times with RMX and the Retro Funk Xpander! "This is a release that deals in sheer quality. Top LA session drummers focusing on laid-back and super-cool funk drumming...more than enough authentically '70s drumming sounds and styles to keep retro-heads happy. Provides all the flavor and spirit of retro soul/funk while at the same time fusing it with a 'must-sample' sound quality and an infectiously musical groove. There is a fantastically wide range of drum sounds used in the grooves...amazingly tight and powerful funk-rock kit sounds that would give even hard rockers a run for their money...Ultimately, Retrofunk's flair, precision, musicianship and sheer usefulness certainly rate it as one of the best drumming discs.